‘You’re a Turk… you’ve a hundred women around you: you buy them and you sell them when your passion dies’ – so says Fiorilla to her new suitor Selim in Rossini’s Il turco in Italia. But despite painting all Selim’s countrymen with a rather broad (and to modern audiences, uncomfortable) brush, Fiorilla is irresistibly captivated by his exotic allure. Like many an operatic character – and indeed like many an opera or ballet – she can’t resist the charms of the East. Il turco in Italia, first performed in 1814, built on the then-current vogue for Turquerie. A few years earlier Mozart enjoyed tremendous success with his 1782 Singspiel Die Entführung aus dem Serail, set in the palace of a Turkish ruler. There was a lot of other successful ‘Turkish’ music from the period, including various instrumental works by both Haydn and Mozart. There were even some fortepianos built with a ‘Turkish’ stop, which could add exotic bells and cymbals to the sound. In the 19th century the focus often shifted further east. Petipa’s 1877 ballet La Bayadère is set in India and tells the story of a temple dancer. Petipa incorporated some references to traditional Indian dance – although the fact that he was able to draw on the choreography he had recently completed for Verdi’s Egyptian opera Aida suggests that La Bayadère’s exotic elements were not all carefully attuned to India. 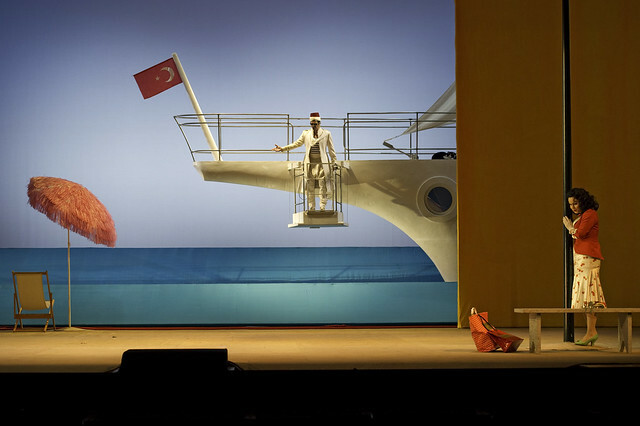 Orient-inspired operas were particularly fashionable in mid-to-late 19th-century France: Bizet’s Sri Lanka-set Les Pêcheurs de perles and Egyptian Djamileh; Massenet’s Thaïs, set in Egypt’s Byzantine rule. Saint-Saëns’ La Princesse jaune has a plot that epitomizes the fashion for exotic Orientalism: Kornélis is obsessed with everything Japanese and falls in love with a painting of ‘Ming’, a Japanese girl. After taking some opium, he fantasizes about a trip to Japan – but, when he awakes, he realizes that he loves his Dutch cousin. The lightly pentatonic score, just like the plot, flirts with Japanese themes but is firmly rooted in the West. 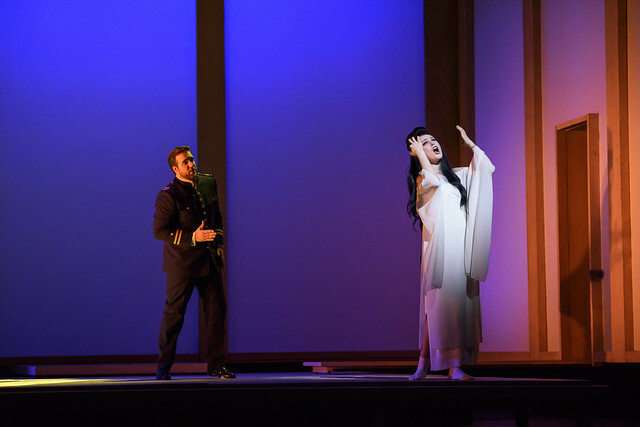 Moving into the 20th century, Puccini’s 1904 opera Madama Butterfly is also an expression of the contemporary fashion for exotic Oriental settings. But Puccini and his librettists Illica and Giacosa are subtle in how they explore the dialogue between East and West. Much of the music has a ‘Japanese’ style, with pentatonic melodies and percussion including glockenspiel and gong – but this is in opposition to the stridently Western style of the Americans’ music. These two styles are carefully intermingled and contrasted over the course of the opera – although the grim conclusion is set to thoroughly un-Western-style music, flying in the face of Western harmonic convention. Butterfly is no mere exotic trinket: she is carefully fleshed out, and her tragedy mirrors the complexity of real-life cultural exchange. As horizons broadened through the 20th century, the novelty of an Oriental setting decreased. Operas and ballets could, after all, be set absolutely anywhere – Siberia, the moon, ‘above the clouds’ – and musical style became more malleable as well. In Szymanowski’s Król Roger, for instance, the sensual ‘Oriental’ music of the Shepherd is contrasted with music drawing on Greek and Byzantine traditions, creating a mixture of styles which goes beyond the conventional East–West divide. Meanwhile, MacMillan’s Song of the Earth makes subtle reference to the Chinese origins of the text of Mahler’s music through gestures as fleeting as flexed wrists and ankles. More recently, operas by composers including Tan Dun and Toshio Hosokawa have been set in China, Japan and elsewhere – but giving a very different perspective from that of Saint-Saëns or Puccini. And Akram Kham and Shobana Jeyasingh are among the choreographers who have created work that combines Western styles with a thorough grounding in traditional South Asian dance. Times may have changed, but there is still something fascinating about how cultures interact. You don't mention Nixon in China.